Here's Jenny...she looks pretty happy...might be her medication. She hurt her hip somehow while I was gone all day at my Breakfast Club quilt gathering. I think she was a victim of slippery ice. Breakup has started and all of our lovely snow has an icy cover as it melts. And here's the devil dog...Tonka. Those glowing eyes are a little too appropriate. This week he has thrown-up a lot of disgusting things...on the carpet....despite the majority of my house being mostly tiled flooring! He has also developed a nasty habit of grabbing food from the kitchen counter-top when I am not in the room. Any suggestions on how to stop this behavior would be appreciated. Right now the best I can do is to retrain myself! I'm jumping into the discussion about copyrights in the quilting world. I don't want rules and regulations shutting down this beautiful treasure that's been a major part of the history of women. I just read a blog that was well researched and includes a video that is very thought provoking and well worth the time to watch. If you haven't read it yet...please do. I'll say it again...please take the time to watch the video. Because we are so fortunate to live in a digital age these issues are hot right now. I think it is very important for all quilters to think about these issues and decided where they stand. I don't want lawyers deciding how it should work...I want us...the quilters who use this mostly as a hobby to decide. If you frighten hobby quilters and restrict their creativity it will hurt the quilting industry for everyone...even those who work hard to make an income from it. What I love about quilting is the sharing...can you imagine a quilting world where you can't share a technique on your blog because it is copyrighted? I'm totally blown away to learn there are fabrics with "For Personal Use Only," printed on the salvages. Really? The fabric I just bought at retail prices I can never turn around and sell cut up in a quilt? Are the labels on our quilts going to require lists of every designer's fabric we used? It's getting crazy! 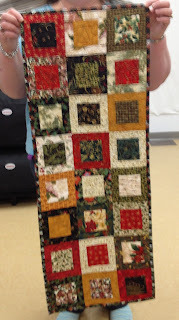 Yesterday was my monthly quilt gathering, Breakfast Club. What a treat to be with women and not at the house building site with men! I was definitely in my comfort zone for a change. The best part of Breakfast Club is show and tell. First up was the project from last month, Oso, from Carrie Nelson's book, "Another Bite of Schnibbles." This is Erin's version done in Thimbleberry fabrics. 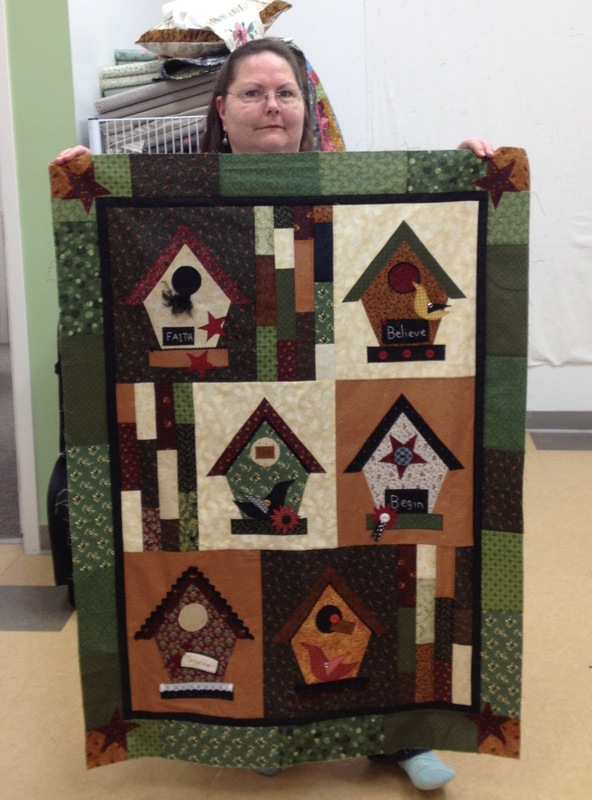 Here's a peek at Erin with this adorable Birdhouse quilt...all the houses have dimensional embellishments. And here's another project from Erin. This is such a cute Christmas runner. Erin quilted a holly leaf with berries in the center of every square...her first venture into freehanding a design. I'm so sorry my photo is out of focus! 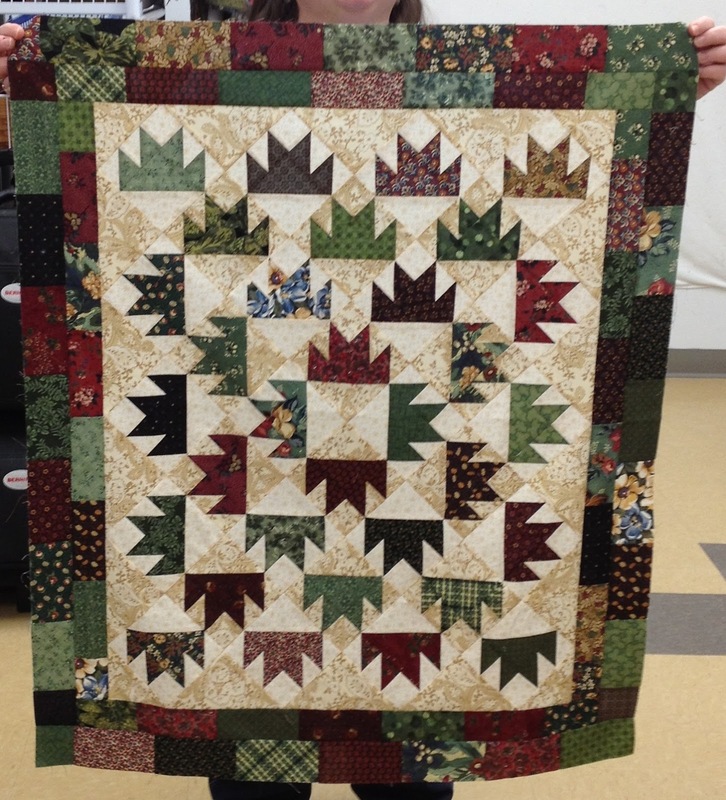 Kathy paid us a visit and delighted us with this runner she just made up! This will hang as a valance in her kitchen window. It is stunning. Here was the big bang finish...a king-sized batik beauty made by Kathy. The pattern is Shadow Box by Mountain Peek Creations. She had the perfect backing...why didn't the photographer get a shot of a corner turned up to show? I plucked away on the border for my Oso quilt top only to realize my calculations were off...seems to be a pattern lately in my border making...grrrr. Thankfully, I had brought another project that required lots of mindless sewing just in case...multitasking is not my strong suit lately. Last week I spent a few evenings and all day Saturday in the studio working on borders. Making your own variation is very gratifying but time consuming...but it's about the process, right? I did the border design with EQ7...and usually it figures out all the math for me but when it created the inner dark purple border to fit the 4-patch squares set on point...it didn't give me measurements for the inner dark purple border. It made them as a template...it wouldn't let me pick rotary cutting as option which was the big problem. My first attempt was wrong (basically I had my sides switched...they aren't the same all the way around) so I spent all of Saturday making and remaking the inner borders for two sides. I sure hope I get it right...the second try I used the formula Judy Laquidara has in her latest book about borders. I'll let you know if I am successful. Sunday I enjoyed my son John's, 21st birthday. He was completely thrilled to get new jeans, a flannel shirt/jacket and a Kindle Fire. I must say I was very impressed with the Kindle Fire for the price...might have to put that on a wish list for myself. Notice how uncooperative the dogs were...usually they have such nice smiles. Cutting tile and grouting! It's been a busy two weeks at the building site of our new house. The stone mason just finished our double sided fireplace. Cedar trim will go in the center slot. The stone is from Hope Alaska and is appropriately called, "Hope Stone." Here's the other side that faces the dining and kitchen area. We are going to add slate tile around the fireplace inset...it will be beautiful. I did work a little on quilting. These strips were made into four patches. The four patches got setting triangles. And now I've got a start on one of the borders for my Sweet Peas in the Meadow. Yesterday I joined the half century club. Enough said about that! I have at least 50 more years worth of projects to tackle so I better get to it. Last week was miserable. I had my cold for the winter season and it was whopper. We've been very busy at the building site so no sewing got done last week. By Friday evening I had a meltdown...that's what happens when you go without Jazzercise and quilting during a stressful week. Saturday morning I woke up in a drugged stupor and realized the cold medicines were harder on me than the cold! I "dried out" and spent the day at home...I love staying home. And just to ensure a perfect day...I baked chocolate chip cookies and peanut butter cookies. I walked the dogs but had to take them separately as there are too many distractions when we walk on the weekends. While I was walking Jenny I left Tonka at home...alone...he had already gotten his walk. When I got home I found all but six of the chocolate chip cookies gone. Does he look a little chubby to you? After that it was time to pop "P & P," into the DVD. (Pride and Prejudice, A&E version with Colin Firth!) By the time Mr. Darcy and Lizzy were married I had finished putting all the blocks and rows together on Sweet Peas in the Meadow. I probably won't be around much during the coming week...I get to start grouting. First up...a 2011 BOM. I've started putting the rows together. I'm also working on a quilt from Carrie Nelson called, Oso. I had to find floor space to layout the first border. There will be little time for sewing this week but at least I have things I can work on for 15 minutes if that's all I have each day. My major goal is to wash Jenny and Tonka today...boy will they be unhappy about that! It really is coming along! Just a quick note about my slow progress. Finished three of the setting blocks for my "Sweet Peas in the Meadow." I'm an excellent gather. Not so great at being a finisher. This is the second month I have failed to finish a UFO. I've been thinking about the January UFO a lot..it's uncharted territory...the next step is top-stitching and drawing with thread to enhance the appliques. I've been thinking about doing the thread play on each block with a piece of batting underneath. After I'm done I would trim away the excess...kind of like a fake trapunto effect. I don't like quilting through the appliques on my longarm but I want a quilted effect...I thought this might work. But of course I need to experiment on a practice piece before I touch the real blocks. One day I will take the plunge...hopefully very soon. I thought the February UFO would be so easy to finish...but I didn't have enough fabric for the layout design I came up with in EQ7. (Initially I planned to go with the layout provided by Shannon at Pieceful Kwilter) I have everything now so hopefully I will get the top done this month. March's UFO...#8....another tough one with lots of work. A Moda U design that involves finishing several hand applique blocks. But even more tough...I need to come up with a final layout for the design. Perhaps you thought I had another wildlife encounter? here's my new friend. Bullwinkle of Bellwinkle...I don't know the difference without antlers in the fall. I was almost close enough to touch this one...it really didn't care about me at all. I guess that's a good thing.